I've learned a lot over the past 10+ years I've spent running this business, but good time management essentials are probably the most important skills I've developed. Since 2006, when I started this business, I've been both in complete control of how I use my time as a solopreneur, and at the same time, completely at the whim of others as a parent of young children. On one hand, I'm the boss of how I choose to spend my time working on my business, and on the other hand, my kid crying in the next room is the boss of how the day is going to go. Coming from a very structured work environment where my days and weeks were pretty routine, I had to work hard to learn how to manage my time when my schedule was both wide open and free in one sense, but also jam-packed and not fully in my control in another sense. I haven't fully mastered it all, but I'm a lot better at it. 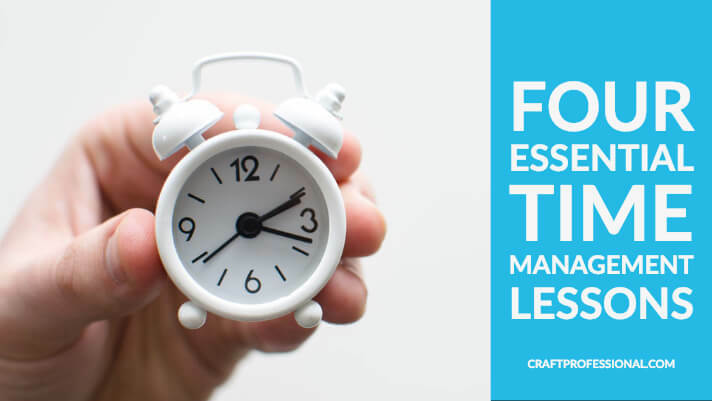 I hope a few of the time management essentials I've learned over the years can help you get to a sense of mastery over your time faster than I got there. 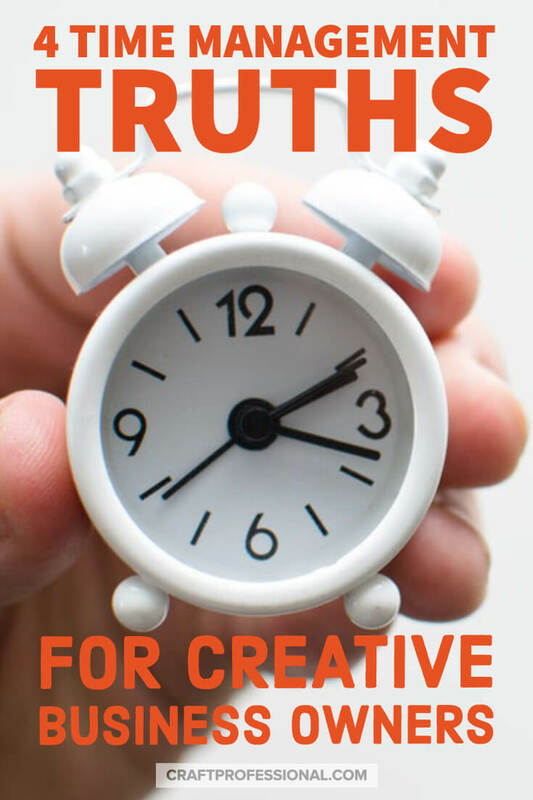 I've discovered 4 truths that help me manage my time, so I can build a business while still keeping space for other priorities. Okay, I know that seems extremely obvious, but it really does need to be said. Over the years, friends have asked me how I built my business. They are intrigued and think they might like to do something similar themselves. We get together and drink coffee, (or wine) and I tell them the basics of how I got started, what they'd need to do, and what they might reasonably expect. That conversation is typically where it ends. They don't move forward with their business dreams. This work I do looks fabulous from the outside looking in, but an entrepreneurial venture generally represents a lot of work before you make a cent. It requires a leap of faith. It demands an enormous amount of self-discipline, and it's not for everyone. If you're my friend, and you're reading this, I'm not judging you for a second. :) There's absolutely nothing wrong with exploring something and discovering it's not for you. It's no wonder people romanticize self-employment. They see the freedom but not the work. They know I don't have to drag myself to an office every day, they never hear me complain about Mondays or annoying bosses, and they know I go on every class trip with my kid, and I don't have to ask anyone's permission to do it. What they realize over coffee or wine, is that building a business requires an enormous amount of work. What they don't normally see is all the time I spend at my computer working, the drive required to get through writer's block, the need to constantly learn and push beyond the comfort zone of my skill set, the statistics analysis, the failed projects, and all the technical tasks that happen behind the scenes. If you're going to build a business, be prepared to roll up your sleeves to do a mountain of work. Your business will present a different set of joys and challenges for you than mine does for me, but whatever yours are, you'll need to be willing to sit down and work through them all every day whether they are joys or challenges. If you're going to work that hard, you need to make time to play and rest, too. When you're self employed, you can always be working. You may have office hours, but work can and often does stretch well beyond those hours. As a solopreneur, it is very easy to become totally immersed in your work, and before you know it, you can't remember the last time you had a real break. It's important to build small breaks into your day, and you need to build larger breaks into your week and your year. In the long run, breaks help us to accomplish more, and they help to keep us happy and healthy. We work away, thinking we'll get more done if we skip breaks. I know how easily it happens. I'm sometimes guilty of it myself. Ironically, it turns out that you don't necessarily get more done just because you work longer hours. Most people's brains can only focus for so long, so, while you're sitting in front of your work, thinking you're being productive, you might not really be getting more done. If you catch yourself procrastinating, or trudging through work more slowly than usual, or skipping tougher, more important tasks in favour of easy, busy work, then you probably need a break. You need to lift your head up from your work and go out in the world for your own well-being and for the sake of your business. Play, new adventures, and changes of scenery give us a fresh mind and a new perspective. I work breaks into my day by setting an alarm to buzz every hour. It reminds me to get up and walk around for a few minutes. My husband comes home for lunch, and I shut everything down, so we can have lunch together. Later in the day, I walk to pick my son up from school. All of these breaks take away actual time spent working, but they make me refreshed and happy, and they make me more efficient because they give me deadlines to work toward during the day. Last weekend, I hunkered down in my office, ready to dig into a technical task that I thought would take hours to complete. Thirty minutes later, I emerged feeling as light as air. It was immensely easier than I had imagined. I danced through the kitchen and had a mini celebration, thrilled that I didn't have to spend my entire Saturday afternoon poking around under the hood of my website. How often does it turn out that you underestimate how long a project will take? I was completely thrilled that Saturday afternoon, because most of the time, projects take far longer than I initially expect. Most of the time we completely overestimate how much we can get done in a day. Are you guilty of wildly overestimating how much you can accomplish in a day? I'm much better at it that I once was, but it's been a tough lesson to learn. A combination of wishful thinking, and a failure to account for distractions and difficulties cause many of us to vastly miscalculate the amount of time a project will take. The hourly timer I mentioned earlier not only gives me quick breaks to stretch, it also makes me very aware of time passing throughout my work day.That awareness of time helps to keep me focused and avoid getting lost down too many rabbit holes. Each hour, I quickly reassess where I am for that day versus where I need to be, so I can refocus if necessary. It helps me to avoid getting lost in busy work or getting too deep into details that aren't really moving a task forward. I also make a point of working on my most complex or demanding tasks during my most focused work time when I'm at my best, and when I'm alone in the house free of distractions. I save easier, but necessary tasks for my less than optimal work times. If I catch myself doing easy work during my best work time, I know I need to refocus. My planner is an invaluable tool for keeping me aware of just how much can be done in a day. I use it to assess how much I've completed to date, and before I end a work session, I make note of what I'll do the next time I sit down to work. Many of us waste a lot of time getting started, especially on more demanding tasks. Once you're started, though, work often starts to flow. If you make note of the next thing you need to do before you quit working, and while you're still on a roll, it will be much easier to dive back into that task do when you start working again. When my kids were very young, my business progress slowed to a crawl because I just didn't have it in me to put in real, focused work hours. My youngest was a terrible sleeper until he was about two and a half. So, even if I had free time to work, I was doing it in a sleep-deprived haze. I read a lot of time management tips back then because I really was trying and failing to make it all work. Every book and article I read at that time seemed largely useless, and some were pretty annoying. Most time management strategies are dependent on you having a large degree of control over your time. That control went out the window when my kids were young. If I could have controlled my time, I wouldn't have needed their advice so desperately. Now that my kids are older and both in school full time, I have luxurious six hour stretches of mostly uninterrupted time five days a week. And if I need to get work done when the kids are home, they are pretty self sufficient at this point. There's a very good chance no one will start crying if I sit down to do a little work. 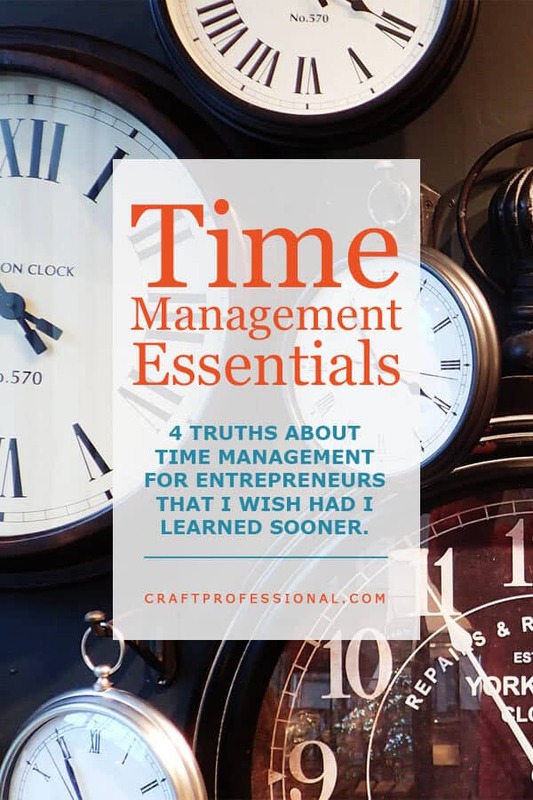 As a result of that experience, whenever I write about time management essentials, I'm always very aware that not everyone is in a place that allows them to implement certain productivity strategies. Maybe you have young children. You might work at a full time job that leaves you drained and exhausted at the end of the day. Perhaps you're putting a lot of time and energy into caring for ill or aging parents. Maybe you're juggling several of those priorities all at once. In hindsight, when my kids were younger, instead of looking for the magical workflow that would allow me to do it all, I wish I had accepted where I was in that phase of my life. I wish I had realized that I was doing the best I could, focusing on other extremely important priorities, and that was just fine. I was still making progress in my business even if it was slower than I would have liked. This was just one of many seasons of my life. What I'm suggesting is, if you're reading about time management because you're struggling to manage a lot of conflicting priorities, be kind to yourself. You are one person, and you can only do so much. Don't give up on important goals that reflect your core values, but do everything you can to choose a reasonable number of priorities and projects you can fit in your life, and focus on them. Soak them up. Do your best with them, and respect the current season of your life. Although I'm definitely not perfect by any stretch of the imagination, I have really improved my productivity recently. Over the two years, I've accomplished far more than I ever did in previous years, and I managed to do it while still prioritizing family and personal time. 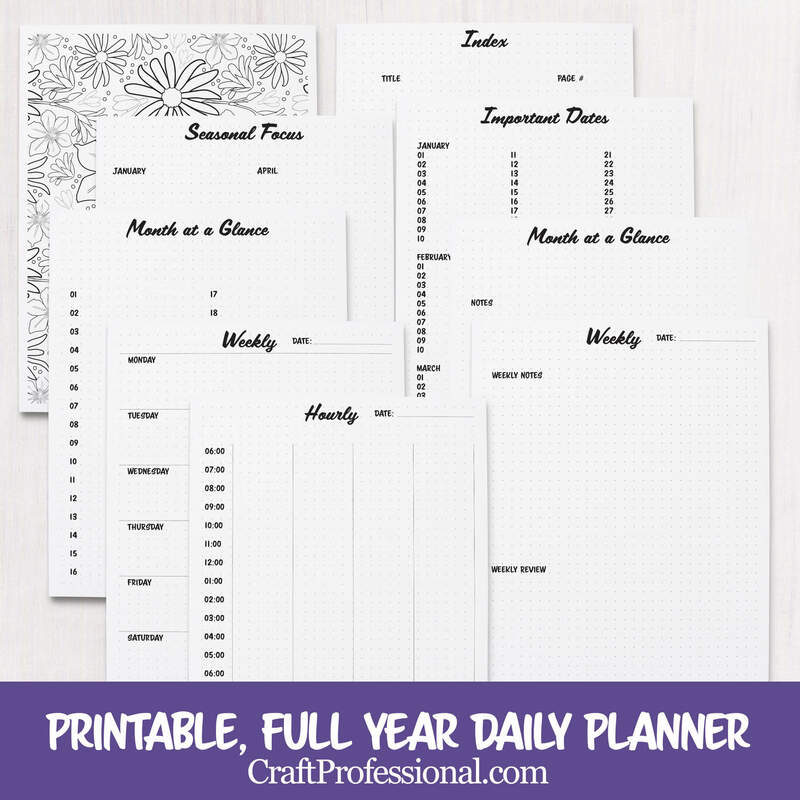 The biggest change that allowed that to happen was using a paper-based planner to track my work and my life. Tracking my work means I don't get too far behind. I can't fool myself into thinking that I've accomplished certain things when I haven't because it's all right there on paper - what I've finished and what I haven't. It's strange to think such a simple tool has made such a big difference, but it has been enormously helpful for me. I've added my printable planner to my Etsy shop, so you can download it if you'd like to try it out for yourself.